Mont Saint-Sauveur, April 7 - 2007 – Winter has returned in full force - just in time for the Empire Shakedown which crowned Albertan Dustin Craven at Mont Saint-Sauveur, Saturday April 7th. 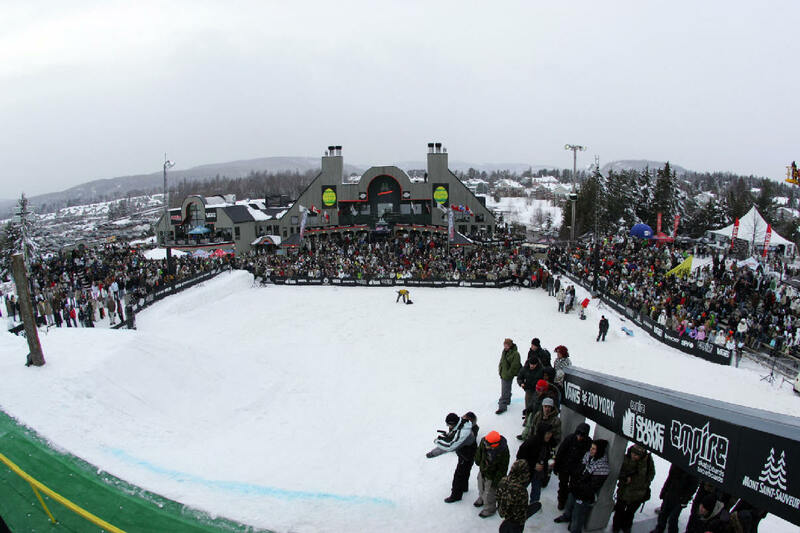 The 18 year-old rider battled fellow snowboarders Charles Reid of Mont-Tremblant, and Ontarian Brad Martin, member of the Canadian National Snowboarding Team. 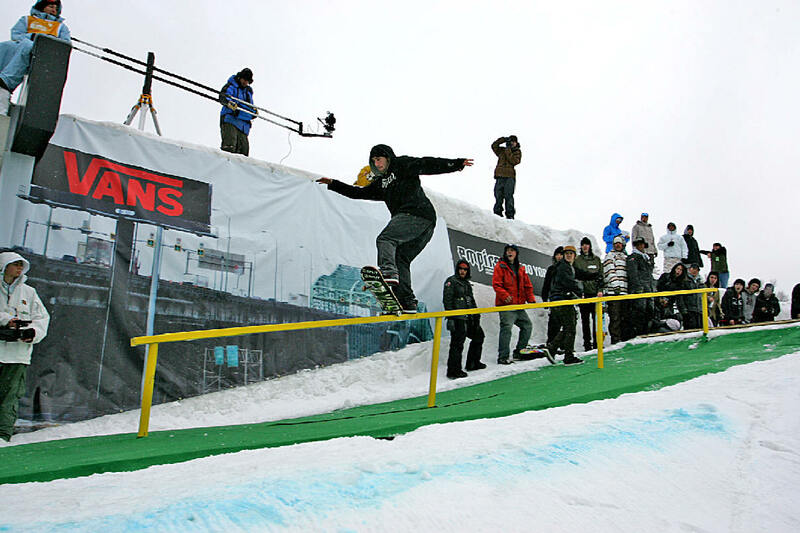 The jump to rail competition, wherein competitors must jump, then slide a rail-ramp gives Shakedown an original approach, forcing competitors to prove their snowboarding prowess in order to garner top honours. This year, contrarie to previous years, a single prize of $15 000 was awarded to the winner: the idea - to favour showmanship. In order to win, it was first necessary to win over the judges who had all the competitors vying for their attention. "Of all the Shakedown competitions, this year's was the most difficult to judge", admitted Chief Judge Alex Auchu. "It was the highest level of riding that I've ever seen. Dustin had two excellent runs, but his first ride was absolutely exceptional. He won because of his fantastic style, but also because of his impeccable technique. He had a lot of amplitude in his jumps and a very high level of difficulty." "It was fantastic. I am so happy - and $15 000 richer!" proclaimed Craven, the 2007’s winner. "The ambiance here is electric and that is why I come back year after year. I did my best and I am particularly pleased with my first run. I really like the concept of jamming, where riders can start when they want to; there is no pressure, we all have fun, and I'm definitely going to be celebrating this victory." Craven concluded gleefully. Craven won the amateur competition last year, whilst Charles Reid finished second at the Coors Light Rail Jam, which took place Friday April 6th. Its not easy to keep crowds coming back year after year, but that is exactly what the organizers of Shakedown do; in its sixth edition, the rail proved itself completely astounding! Situated just above the Empire store, specially build for the event; the rail consisted of three ramps, one of which was attached to a tree trunk. "Each year, we have surpassed ourselves in order to insure a fantastic show. You have to know how to plan and innovate!" admitted Brendan O’Dowd, co-organizer of the event, along with Patryck Bernier. "The unit where we had the tree in the snow was really quite different, something that's never been done before. It really made the rail very imposing, intimidating. Obstacles like that are our way of making ourselves known; our trade-mark." As a testament to Shakedown's growing importance as a major event, this year the majority of key snowboarding magazines and journals were present to cover the competition, proving that Shakedown has indeed made a name for itself. Journalists from Switzerland and New York were among those present to publicize and report on the event. The annual competition is Canada's most important snowboarding event, attracting new competitors and more than 25 000 spectators to the competition site. Mont Saint-Sauveur, 7 avril 2007 – L’hiver a repris de la vigueur juste à temps pour la finale de l’Empire Shakedown qui a couronné l’Albertain Dustin Craven au Mont Saint-Sauveur, samedi. Le rider de 18 ans a devancé les snowboarders Charles Reid, de Mont-Tremblant, et l’Ontarien Brad Martin, membre de l’équipe nationale de snowboard. Le concept jump to rail où le compétiteur enchaîne un saut et un passage sur rampe, confère au Shakedown une approche originale qui force les compétiteurs à beaucoup de prouesses. « C’est fantastique. Je suis heureux et je suis plus riche de 15 000 $ », a lancé le gagnant de 2007. « L’ambiance ici est électrisante et c’est pourquoi je reviens chaque année. J’ai fait de mon mieux et je suis particulièrement content de ma première descente. J’aime bien le concept du jam où on part quand on veut. Il n’y a pas de pression, on s’amuse et là, je vais aller célébrer ma belle victoire », a-t-il conclu dans un grand cri de joie. Craven avait remporté l’épreuve amateur l’année passée, tandis que Reid a fini deuxième du Coors Light Rail Jam présenté vendredi. Sébastien Toutant, gagnant du Shakedown 2006, s’est classé au 6e rang lors de la semi-finale pour ensuite participer à la finale Shakedown 2007 avec 16 autres riders, pour terminer au 13e rang. Et cela se voit par la couverture de l’événement. Cette année, la majorité des grands magazines de snowboard américains a envoyé des journalistes sur place. Il y avait même des équipes de reporters de Suisse et de New York. Le rendez-vous annuel, le plus important événement de snowboard au pays, a attiré à nouveau cette année près de 25 000 spectateurs sur le site des compétitions.